Moka Only spent his early days as a graffiti artist before trading in his paint cans for a mic. 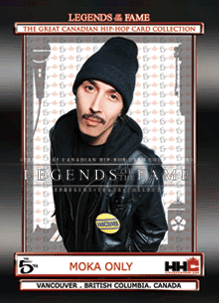 He soon established himself as a Canadian rap mainstay, collaborating with acclaimed groups such as Swollen Members and Len. Moka's experimental yet classic beats, fused with his smooth voice and robust rhymes, offer an eclectic take on contemporary Hip-Hop. Considered one of Canada's most prolific emcees, this West Coast legend has released over forty-five albums to date as a solo artist.